Palo Alto, CA – January 10, 2018 — Science Exchange, the world’s leading and most secure enterprise platform for outsourced research and development (R&D), teamed up today with Lab Launch, a nonprofit working to provide affordable and high-quality laboratories to biotech startups. This partnership with Science Exchange allows Lab Launch’s resident companies to easily supplement and complement their in-house resources with external research tools, technologies, and expertise. Science Exchange enables immediate access to over 2,500+ commercial CROs, academic labs, and government facilities under a single marketplace agreement, in addition to a 24/7 PhD-level support by Science Exchange staff scientists. 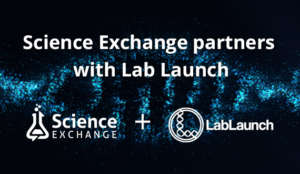 Lab Launch is the latest R&D organization to choose to partner with Science Exchange and joins more than 30 enterprise clients and Life Science incubators that are effectively managing their outsourced R&D with Science Exchange-powered marketplaces. Lab Launch Inc is a 501(c)(3) non-profit working to establish a more dynamic biotech startup environment in Los Angeles. Our mission is to enable LA’s scientists and entrepreneurs to develop their ideas in affordable, high-quality lab facilities, with access to services and a supportive innovation community to accelerate their success. Request a demo of Science Exchange’s platform to see how your organization can benefit from increased access to innovation and organizational efficiency.